Alejandro Mon, wearing the Grand Cross of the Order of Charles III, by José Casado del Alisal. 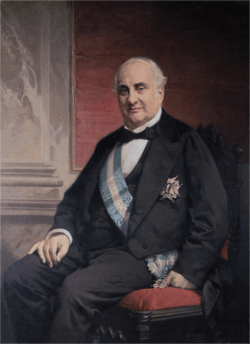 Alejandro Mon y Menéndez (26 February 1801 in Oviedo, Principality of Asturias, Spain – 1 November 1882) was a Spanish politician and jurist who served as Prime Minister of Spain in 1864, during the reign of Queen Isabella II. Mon was born in Oviedo, being the eldest son of Miguel Mon y Miranda and Francisca Menéndez y de la Torre. His only sister, Manuela, was married to the Asturian Pedro José Pidal, 1st Marquis of Pidal, also a prominent politician who served several times as Prime Minister. He studied Law in the University of Oviedo, where he became interested in politics and approached the Moderate Party. In the regency of Queen Maria Christina of the Two Sicilies (1833–1840), Mon was appointed for his first high political office, being Minister of Finance from 1837 to 1838, in a moderate cabinet headed by Narciso Fernández de Heredia, 2nd Count of Heredia-Spínola. During the regency of the progressivist Baldomero Espartero (1840–1843), he wasn't part of any of the cabinets, but kept active in political life. When the moderates came back to power in 1844, starting a period known as the Moderate Decade, Mon was called by the new Prime Minister Ramón María Narváez, 1st Duke of Valencia, again as Minister of Finance. He held this post from 1844 to 1845, and carried out the Tax reform of 1845, which established the basis of the current tax system of Spain. This reform was executed in collaboration with Ramón de Santillán, and it is popularly known as the Mon-Santillán reform. After the downfall of the moderates, the unionist Leopoldo O'Donnell, 1st Duke of Tetuan offered him several ministerial portfolios that he always declined. Mon preferred to be in posts away from the first line of political life, such as Ambassador to the Holy See or to France. However, he returned to active politics in 1864, when he replaced Lorenzo Arrazola y García as Prime Minister, although his cabinet only lasted 9 months because of the social and political instability (5 years later the Spanish Glorious Revolution took place). Mon lived long enough to see the reign of Amadeo I of Spain, the First Spanish Republic and finally restoration of King Alfonso XII, which he supported as personal friend of Antonio Cánovas del Castillo. Howbeit, he wasn't active politically during the Restoration and only kept the honorary post of life senator. He retired to his hometown, Oviedo, where he died in 1882.